Mount Desert Island scallop diver Andy Mays cuts out the innards of a scallop on his boat Lost Airmen, March 7, 2017. EASTPORT, Maine — Maine fishing regulators say they have shut down a few areas to scallop fishing, including parts of the state’s most fertile scalloping ground. The Maine Department of Marine Resources has shut down Johnson Bay and Eastport Breakwater in the Cobscook Bay area. Cobscook Bay is the most important fishing area for Maine scallopers. The state said it’s also shutting down Casco Passage, which is in the northwest corner of the Swan’s Island fishing area. Officials with the marine department said survey results from earlier this month show the target harvest level for Johnson Bay and Eastport Breakwater has been exceeded. 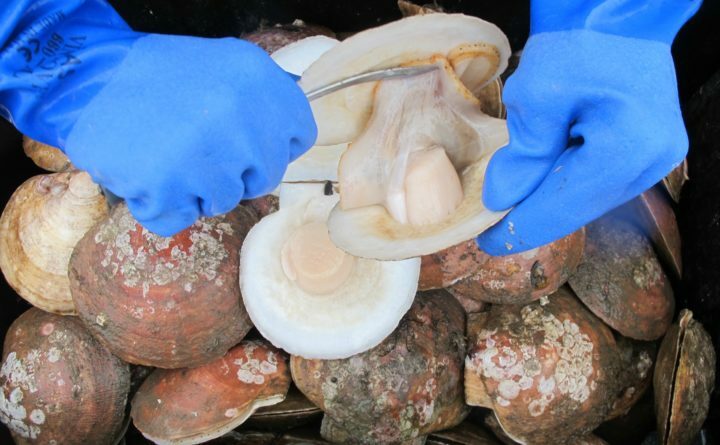 The state enforces target harvest levels to prevent overfishing of scallops, which are among the most valuable marine resources in the state.